DeBruyckere Law Offices can provide the help that you need to select a nursing home and make certain you can afford it. Our legal team also offers assistance to family members who must find nursing care for their loved ones after a medical emergency that makes it impossible to continue independent living. When is nursing home planning necessary? What should be part of a nursing home plan? How can a nursing home planning lawyer help? Nursing home planning is something everyone should do, and it should be taken care of sooner than you may have thought. It is not only seniors that could be forced to move into a nursing home. Younger people have accidents, injuries, and illnesses that could necessitate a temporary or permanent stay in a nursing care facility. Because care could become necessary at any time, you should talk with an attorney when you have assets to protect or when you begin thinking ahead about incapacity planning. One of the most important components of a nursing home plan is a plan to pay for nursing home care, and this also must be done at least five years before care is required. Most plans to get nursing home care paid for center around qualifying for Medicaid coverage, as Medicaid is one of the only sources of payments for nursing home care. Medicaid has resource limitations and will look back five years from the time you apply for benefits to see if you tried to transfer wealth. This five-year look back can make it much more difficult, or even impossible, to get nursing home care costs covered if you have not made plans long before you need care. Making your plan is easy with the right legal help, and there is no reason to put off the process and leave your assets at risk or leave yourself vulnerable to ending up in a bad nursing home. 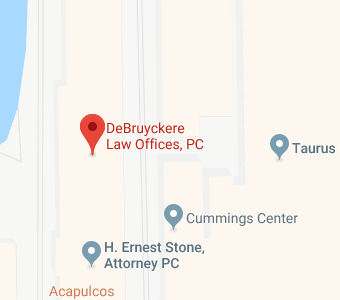 If you don’t have a plan yet, you should call DeBruyckere Law Offices now to find out if it is time for our legal team to help you create one. Research into a care facility where you wish to live if you need nursing home care. Advanced medical directives to provide instructions to your family and to the nursing facility about the kinds of care you want to receive. A review of nursing home admissions paperwork at your chosen facility so you can understand resident’s rights. The use of trusts and other legal tools to protect assets and ensure you can get nursing home care costs paid for when you must seek care. It is important that a comprehensive plan is made in advance of the time when nursing home care is needed. If it is too late and a medical emergency has resulted in a need for immediate nursing home care for someone in your family, DeBruyckere Law Offices can provide you with essential guidance in finding a care facility, reviewing the nursing home admissions agreement, and making plans to pay for it. A nursing home planning lawyer can offer guidance on whether you should make a nursing home plan and can provide assistance with using the right legal tools to make your plans. We discuss your goals, finances, and family situation with you to identify the steps to planning that will protect you and the people you love. Our legal team will then move forward with helping you to use trusts and other important legal tools to achieve the peace-of-mind that comes with being ready if you need nursing home care. To find out more about the ways in which a nursing home planning lawyer can help you, give us a call or contact us online. Our elder law firm serves clients with offices in Beverly, North Andover, and Woburn, Massachusetts, as well as Nashua and Londonderry, New Hampshire. Call today to discover what we can do for you.